The electronic air cleaner installed in a ventilation system is a highly effective particulate air filtration system, specifically designed to remove small particles from the air. However, many of the most common allergy irritants (mold, pollen, pet dander, lint and household dust) are fairly large particles averaging 10 microns and up in size. As larger particles build up on the metal collection plates, the air cleaner rapidly loses it’s efficiency and must be frequently cleaned to maintain peak performance. In addition, larger particle deposits can break off and be blown through the air cleaner instead of being captured by the unit, or can cause high voltage arcing which produces a snapping sound in the duct work. 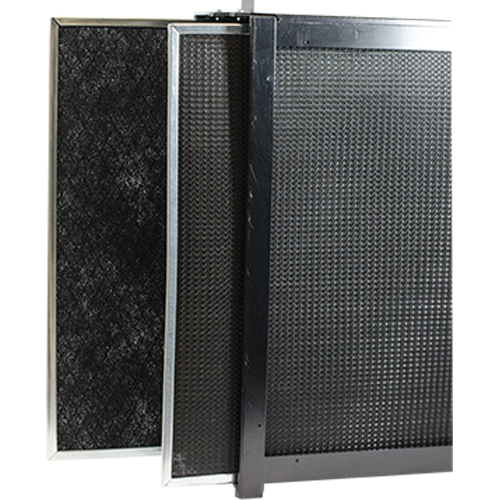 A prefilter installed before the cells is required to maintain the working efficiency of the electronic air cleaner, capturing larger particles and allowing the cells to perform effectively for longer periods before needing cleaning. An activated carbon afterfilter is recommended to adsorb any odors or fumes being recirculated through the home and to capture particles which did not take an electrical charge. Odors are removed from the air through your ventilation system, without spraying artificial scents. The afterfilter also removes ozone emitted from electrical discharges and captures ash “brush-off” from the plates. Independent testing shows 40% increase in average Dust Spot Efficiency by using Permatron’s electrostatic prefilter in your electronic air cleaner.